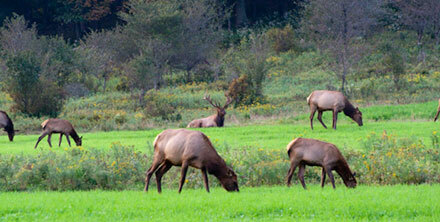 The Pennsylvania Wilds is home to the largest elk herd in the northeast US. 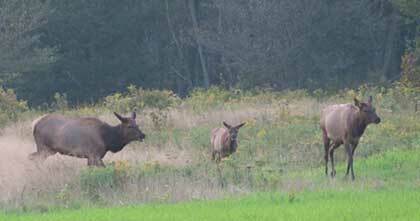 As is the case of all eastern elk, the Pennsylvania native elk were hunted to extinction. According to the PA Dept of Conservation the last native elk was killed in 1867. 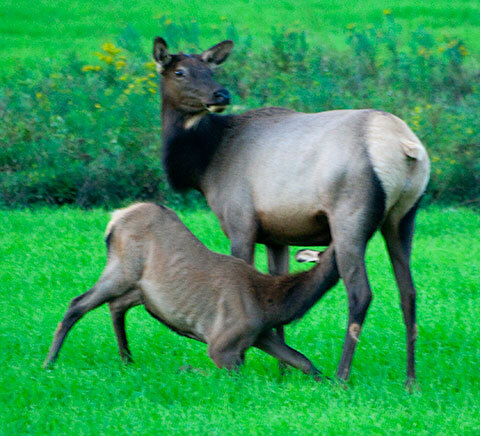 Efforts to restore elk to Pennsylvania started in about 1913 with the release of western elk. The relocated animals flourished and 98 antlered bulls were legally killed in open hunting seasons between 1923 and 1931. Because of a declining herd size, hunting of elk has been prohibited since 1932. A recent survey indicated the herd size to be more than 600 animals, up from a low of 35 animals in the early 1970s. 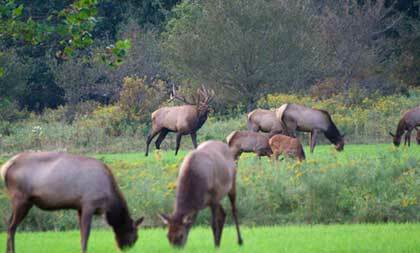 Pennsylvania has established several elk viewing spots. We were able to visit some of them. The first spot we visited had a well constructed blind to hide us from the elk. We were told that the best chances for viewing were in the early morning or near dusk. Since we don't like early morning, we waited until late afternoon to head to the blind. When we got there, the elk were no where to be seen. 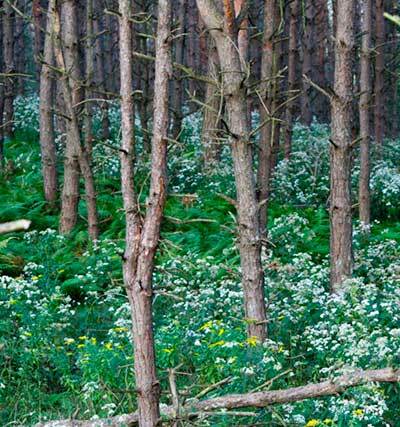 The place was pretty with trees and flowers--but no elk. After a bit more people started to arrive but still no elk. A few people gave up and left, but we decided to wait a bit longer. Then all of the sudden the elk started to come out of the woods into the meadow. First the cows and the calves and then a large bull elk. He was the one in charge. He spent a bit of time supervising and bugling just to make sure that the world--and especially any other bull elk in the vicinity--knew that he was there. Then he settled down to regally watch over his herd. The second spot we visited overlooked a large meadow, but had no blind. We were not able to get as close to the elk as in the first spot. Two different groups of elk showed up here. Each group was supervised by an impressive bull elk. The two bulls did a little bugling to try and attract a cow or two from the other group. But didn't have any success. The bull elk in Pennsylvania appeared to be larger than the elk in Great Smoky Mountains National Park-- probably because the elk in the smokies are younger. 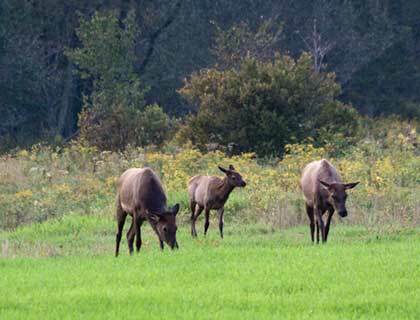 Pennsylvania has done a great job in restoring the elk herd. 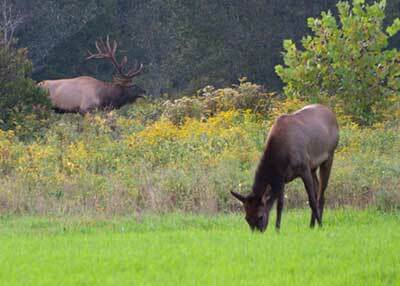 Here are a couple of links for more information about the Pennsylvania elk herd. Travels with Nessie Home :: Site Map:: Contact webmaster@ncsparks.com-email us:: Copyright Leslie Sparks 2006, 2007, 2008, 2009, 2010, 2011, 2012,2013,2019:: Last modified: May 22 2013.